Playgroup WA has expanded its work with Aboriginal families and communities in recent years. This work has been undertaken with a commitment to employ local Aboriginal staff wherever possible and to seek partnership rather than competition with local Aboriginal controlled agencies. Our Aboriginal Playgroup program areas include a number of Supported Playgroups, the Aboriginal Play and Learning Network and Forum and professional development of Aboriginal staff at the request of other agencies (see Fee for Services). 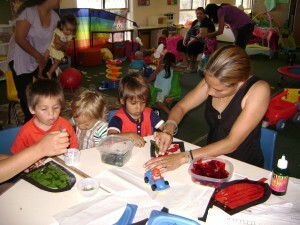 Playgroup WA is a key agency supporting the WA Aboriginal Play and Learning Network. The group meets 4 times a year as a support for staff - in particular Aboriginal staff - who work with Aboriginal families and children 0-5 years of age. Playgroup WA also works in collaboration with other agencies and government departments to hold a biennial one day Aboriginal Play and Learning Forum which attracts up to 140 delegates from across the State. The working group includes Aboriginal and non-Aboriginal members. Each forum has a different theme relating to child development, play and the early years and includes guest speakers and hands on activity sessions. The next forum is scheduled for 2018. As a component of the Indigenous Advancement Strategy under the Children and Schooling Program, Playgroup WA is funded by the Prime Minister and Cabinet to provide supported playgroups to Aboriginal communities in various locations across the Wheatbelt and Ngaanyatjarra Lands. Playgroup is operating 6 playgroup sessions in communities across the Wheatbelt and working in partnership with the Ngaanyatjarra Shire to support 11 playgroup sessions in four communities across the Lands. Reducing the impact of health risk factors, social disadvantage and other issues on children's development through prevention and early intervention strategies.